Teaching children how to resolve conflict. 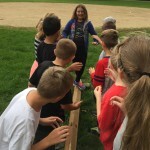 Experiential learning can improve group dynamics in the workplace. Valuable experience outside the classroom. This level is for teams who benefit from on-site consultation to continue developing advanced team skills, including conflict resolution, personality conflicts, team dysfunction and follow through. The group will learn to transfer valuable skills to the organization by implementing significant positive change through professionally facilitated activities. Also for Teams who have experienced our conflict resolution or integration and are ready to move forward. 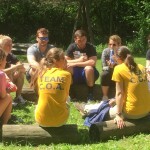 Your team meets with COA staff to determine goals and to plan a customized course of action. The team works with facilitators to plan specific work-related integration activities that can bring lasting changes to the organization. This step involves the facilitators visiting the workplace to support the team’s efforts. The initial tasks will be relatively easy and will become progressively more challenging as the day and experience continues. We ask that participants come to the experience with an open mind and a willingness to learn about themselves and their team.